The ‘Art Series’ range includes a sour cherry cheesecake cookie that will be served on selected Qantas domestic flights until September 2018. For international flights, a Choc Pretzel and Pecan cookie will be served. Packaging for the range features artwork from Byron Bay graffiti artist Davey Mac who goes by the artistic name of Teazer. Marketing Manager at Byron Bay Cookie, Emilie Emond, said it was important to celebrate 15 years with Qantas in a meaningful way. “Packaging design is at the core of our brand’s image and working with Teazer has definitely enhanced our creative process, whilst allowing us to support a local artist,” Emond said. To help further mark the occasion, Qantas domestic flight passengers will have the chance to select the next Byron Bay Cookie flavour whilst going in the run to win a Byron Bay foodie holiday. 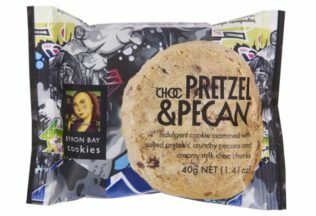 Outside of Qantas flights, Byron Bay Cookies Art Series can be purchased at the Byron Bay Cookie website for AUD $2.50 per 40g cookie. Purchases made online can be shipped worldwide.